Stormwater Retention Ponds are used to collect runoff during periods of heavy rain. Cities need proper retention ponds because, during periods of storms, their existing stormwater lines may not have the capacity to handle all of the runoff. Inability to handle runoff can lead flooding, sinkhole formation and groundwater contamination. Parts of the Southwest are especially prone to this issue because they have less frequent, but often more intense periods of rain. Stormwater retention ponds are often found next to shopping centers or subdivisions. Many cities require developers to add retention ponds because residential and commercial properties have much higher storm runoff rates than natural, undeveloped land. These developments have more concrete and pavement, and that causes much faster runoff that can overload the city stormwater lines. Runoff from residential, commercial and industrial areas may also contain oil, pesticides, and other pollutants that need to be controlled or treated before they enter the groundwater supply. 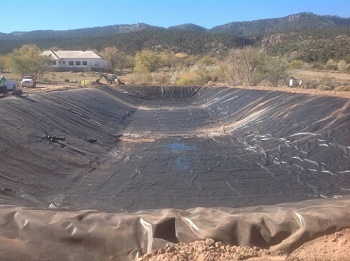 While some stormwater basins aren’t much more than a dry pond, others require a geomembrane to line the basin. If the surrounding terrain features limestone, dolomite, or other soluble rock types, rapid and excessive stormwater runoff can increase the risk of sinkholes. If the runoff contains pollutants that might contaminate groundwater. If water seeping from the stormwater pond risks mobilizing existing contaminants in the soil or groundwater. Western Liner offers geomembrane liners that are ideal for stormwater catch basins. The Aqua series provides reinforced polyethylene (RPE) geomembranes that are perfect for these basins because they are mostly impermeable and prevent water leakage, which allows the stormwater to travel easily to its destination. In addition, the Aqua series of RPE offers a long-term guarantee. The RPE geomembranes are tough and long-lasting, which makes them perfect for erosion control and water treatment. We manufacture permeable needle punch non-woven geotextilesspecifically for this application. They come in several gauges and can be fabricated in our factory in your needed panel size and shape, saving you time and money during the installation process. Our company maintains factories in Tolleson, AZ, Romulus, NY, and Great Bend, KS, so that we are able to service your needs wherever you are located in the country. For any questions and inquiries call today and one of our cover and liner experts will be happy to assist you.